As a player, Klopp spent most of his 15-year career at Mainz 05 in the second tier of German football after signing for the club in 1990. A hard-working and physical player, he was deployed as a striker, before converting to play as a defender in 1995 until his retirement in 2001, during which time he began to study management. Upon his retirement in 2001, Klopp became the club's manager, leading them to promotion to the Bundesliga in 2004. After suffering relegation in the 2006–07 season and being unable to achieve promotion the following campaign, Klopp resigned at Mainz in 2008, departing as the club's longest-serving manager. Klopp then became manager of Borussia Dortmund, guiding them to the Bundesliga title in 2010–11. The next season Klopp guided Dortmund to their first ever domestic double as they scored a record number of points in a season[note 2] and registered a record-equalling number of wins in winning the 2011–12 Bundesliga, as well as winning the DFB-Pokal. In 2013, he guided Dortmund to the Champions League final, where they lost 2–1 to Bayern Munich. He left Dortmund in 2015 as their longest-serving manager, having won a total of five trophies with the club, including two league titles, one DFB-Pokal and two DFL-Supercups. Born in Stuttgart, the state capital of Baden-Württemberg, to Norbert Klopp, a travelling salesman and a former goalkeeper, Klopp grew up in the countryside in the Black Forest village of Glatten near Freudenstadt with two older sisters. He started playing for local club SV Glatten and later TuS Ergenzingen as a junior player, with the next stint at 1. FC Pforzheim and then at three Frankfurt clubs, Eintracht Frankfurt II, Viktoria Sindlingen and Rot-Weiss Frankfurt during his adolescence. Introduced to football through his father, Klopp was a supporter of VfB Stuttgart in his youth. As a young boy, Klopp aspired to become a doctor, but he did not believe he "was ever smart enough for a medical career", saying "when they were handing out our A-Level certificates, my headmaster said to me, 'I hope it works out with football, otherwise it’s not looking too good for you'". While playing as an amateur footballer, Klopp worked a number of part-time jobs including working at a local video rental store and loading heavy items onto lorries. In 1988, while attending the Goethe University of Frankfurt, as well as playing for Eintracht Frankfurt non-professionals, Klopp managed the Frankfurt D-Juniors. In the summer of 1990, Klopp was signed by Mainz 05. He spent most of his professional career in Mainz, from 1990 to 2001, with his attitude and commitment making him a fan-favourite. Originally a striker, Klopp began playing as a defender in 1995. That same year, Klopp obtained a diploma in sports science at the Goethe University of Frankfurt, writing his thesis about walking. He retired as Mainz 05's record goal scorer, registering 56 goals in total, including 52 league goals. Klopp confessed that as a player he felt more suited to a managerial role, describing himself saying "I had fourth-division feet and a first-division head". Recalling his trial at Eintracht Frankfurt where he played alongside Andreas Möller, Klopp described how his 19-year-old self thought, "if that’s football, I’m playing a completely different game. He was world-class. I was not even class". As a player, Klopp closely followed his manager's methods on the training field as well as making weekly trips to Cologne to study under Erich Rutemöller to obtain his Football Coaching Licence. Upon his retirement playing for Mainz 05, Klopp was appointed as the club's manager on 27 February 2001 following the sacking of Eckhard Krautzun. The day after, Klopp took charge of their first match, which saw Mainz 05 secure a 1–0 home win over MSV Duisburg. Klopp went on to win six out of his first seven games in charge, eventually finishing in 14th place, avoiding relegation with one game to spare. In his first full season in charge in 2001–02, Klopp guided Mainz to finish 4th in the league as he implemented his favoured pressing and counter-pressing tactics, narrowly missing promotion. Mainz finished 4th in 2002–03, denied promotion again on the final day on goal difference. After two seasons of disappointment, Klopp led Mainz to a third place finish in the 2003–04 season, securing promotion to the Bundesliga for the first time in the club's history. Despite having the smallest budget and the smallest stadium in the league, Mainz finished 11th in their first top-flight season in 2004–05. Klopp's side finished 11th again in 2005–06 as well as securing qualification for the 2005–06 UEFA Cup, although they were knocked out in the first round by eventual champions Sevilla. At the end of the 2006–07 season, Mainz 05 were relegated, but Klopp chose to remain with the club. However, unable to achieve promotion the next year, Klopp resigned at the end of the 2007–08 season. He finished with a record of 109 wins, 78 draws and 83 losses. 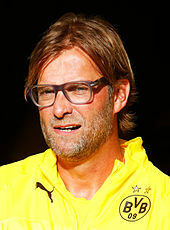 In May 2008, Klopp was approached to become the new manager of Borussia Dortmund. Despite having interest from German champions Bayern Munich, Klopp eventually signed a two-year contract at the club, which had finished in a disappointing 13th place under previous manager Thomas Doll. Klopp's opening game as manager was on 9 August 2008 in a 3–1 DFB-Pokal victory away to Rot-Weiss Essen. In his first season, Klopp won his first trophy with the club after defeating German champions Bayern Munich to claim the 2008 German Supercup. He led the club to a sixth-place finish in his first season in charge. The next season Klopp secured European football as he led Dortmund to a fifth-place finish, despite having one of the youngest squads in the league. Klopp at a press conference ahead of Dortmund's title-winning 2010–11 season. After losing 2–0 to Bayer Leverkusen on the opening day of the 2010–11 season, Klopp's Dortmund side won fourteen of their next fifteen matches to secure the top spot in the league for Christmas. They clinched the 2010–11 Bundesliga, their seventh league title, with two games to spare on 30 April 2011, beating 1. FC Nürnberg 2–0 at home. Klopp's side were the youngest ever side to win the Bundesliga. Klopp and his team successfully defended their title, winning the 2011–12 Bundesliga. Their total of 81 points that season was the greatest total points in Bundesliga history and the 47 points earned in the second half of the season also set a new record. Their 25 league wins equalled Bayern Munich's record, while their 28-league match unbeaten run was the best ever recorded in a single German top-flight season. [note 3] Dortmund lost the German Super Cup in 2011 against rivals Schalke 04. On 12 May 2012, Klopp sealed the club's first ever domestic double, by defeating Bayern Munich 5–2 to win the 2012 DFB-Pokal Final, which he described as being "better than [he] could have imagined". Dortmund's league form during the 2012–13 season was not as impressive as in the previous campaign, with Klopp insisting that his team would focus on the UEFA Champions League to make up for their disappointing run in that competition in the previous season. Klopp's team were drawn against Manchester City, Real Madrid and Ajax in the competition's group of death. However, they did not lose a game, topping the group with some impressive performances. Dortmund progressed all the way to the final, meeting José Mourinho's Real Madrid again in the semi-final stages of the competition. After an excellent result against them at home in the first leg, a 4–1 victory, a 2–0 loss meant Dortmund narrowly progressed to the final. On 23 April 2013, it was announced that Dortmund's crucial playmaker Mario Götze was moving on 1 July 2013 to rivals Bayern Munich after they had triggered Götze's release clause of €37 million. Klopp admitted his annoyance at the timing of the announcement of Götze's move, as it was barely 36 hours before Dortmund's Champions League semi-final with Real Madrid. Klopp later said that Dortmund had no chance of convincing Götze to stay with Dortmund, saying, "He is a Pep Guardiola favourite". Dortmund lost the final 2–1 to Bayern Munich, with an 89th-minute goal from Arjen Robben. Dortmund finished in second place in the Bundesliga. They also lost the 2012 DFL-Supercup, and were knocked out of the DFB-Pokal in the round of 16. Klopp left Dortmund at the end of the 2014–15 season. At the beginning of the 2013–14 season, Klopp extended his contract until June 2018. Klopp received a fine of €10,000 on 17 March 2014 after getting sent off from a Bundesliga match against Borussia Mönchengladbach. The ejection was a result of "verbal attack" on the referee. Deniz Aytekin, who was the referee, stated that Klopp's behavior was "rude on more than one occasion". Borussia Dortmund vorstand chairman Hans-Joachim Watzke stated that "I have to support Jürgen Klopp 100 percent in this case" because he saw no reason for a fine and denied that Klopp insulted the fourth official. Dortmund finished the 2013–14 season in second place. On 4 January 2014 it was announced that Klopp's star striker Robert Lewandowski signed a pre-contract agreement to join Bayern Munich at the end of the season, becoming the second key player after Götze to leave the club within a year. Also during the 2013–14 season, Dortmund won the German Super Cup, but were knocked out of the Champions League in the quarter-finals by eventual champions Real Madrid. Dortmund started the 2014–15 season by winning the German Super Cup. After a disappointing beginning of the season, Klopp announced in April that he would leave Borussia Dortmund at the end of the 2014–15 season, saying "I really think the decision is the right one. This club deserves to be coached from the 100% right manager" as well as adding "I chose this time to announce it because in the last few years some player decisions were made late and there was no time to react", referring to the departures of Götze and Lewandowski in the seasons prior. He denied speculation that he was tired of the role, saying, "It's not that I'm tired, I've not had contact with another club but don't plan to take a sabbatical". Confronted with the thesis that Dortmund's form immediately improved after the announcement, he joked, "If I'd known, I would have announced it at the beginning of the season". His final match in charge of the team was the 2015 DFB-Pokal Final, which Dortmund lost 3–1 against VfL Wolfsburg. Dortmund finished in the league in seventh place and were knocked out of Champions League in the round of 16 by Juventus. He finished with a record of 179 wins, 69 draws, and 70 losses. Klopp after winning against Middlesbrough on the final day of the 2016–17 season to secure fourth in the league. On 8 October 2015, Klopp agreed a three-year deal to become Liverpool manager, replacing Brendan Rodgers. In his first press conference, he described his new side saying "it is not a normal club, it is a special club. I had two very special clubs with Mainz and Dortmund. It is the perfect next step for me to be here and try and help" and stating his intention to deliver trophies within four years. During his first conference, Klopp dubbed himself 'The Normal One' in a parody of José Mourinho's famous 'The Special One' statement in 2004. His debut was a 0–0 away draw with Tottenham Hotspur on 17 October 2015. On 28 October 2015, Klopp secured his first win as Liverpool manager against Bournemouth in the League Cup to proceed to the quarter-finals. His first Premier League win came three days later, a 3–1 away victory against Chelsea. After three 1–1 draws in the opening matches of the UEFA Europa League, Liverpool defeated Rubin Kazan with 1–0 in Klopp's first win in Europe as a Liverpool manager. On 6 February 2016, he missed a league match to have an appendectomy after suffering suspected appendicitis. On 28 February 2016, Liverpool lost the 2016 League Cup Final at Wembley to Manchester City on penalties. On 17 March 2016, Klopp's Liverpool progressed to the quarter-final of the UEFA Europa League by defeating Manchester United 3–1 on aggregate. On 14 April 2016, Liverpool fought back from a 3–1 second half deficit in the second leg of their quarter-final match against his former club, Borussia Dortmund, to win 4–3, advancing to the semi-finals 5–4 on aggregate. On 5 May 2016, Klopp guided Liverpool to their first European final since 2007 by beating Villarreal 3–1 on aggregate in the semi-finals of the UEFA Europa League. In the final, Liverpool faced Sevilla, losing 1–3 with Daniel Sturridge scoring the opening goal for Liverpool in the first half. Liverpool finished the 2015–16 season in eighth place. On 8 July 2016, Klopp and his coaching staff signed six-year extensions to their deals keeping them at Liverpool until 2022. Liverpool qualified for the Champions League for the first time since 2014–15 on 21 May 2017, after winning 3–0 at home against Middlesbrough and placing fourth in the 2016–17 Premier League season. Klopp guided Liverpool to their first UEFA Champions League Final since 2007 in 2018 after a 5–1 aggregate quarter-final win against the eventual Premier League champions, Manchester City and 7–6 aggregate win over Roma in the semi-final. However, Liverpool went on to lose in the final 3–1 to Real Madrid. This was Klopp's sixth defeat in seven major finals. Despite their attacking prowess, Klopp's side had been criticised for their relatively high number of goals conceded, something which Klopp sought to improve by signing defender Virgil van Dijk in the January transfer window, for a reported fee of £75 million, a world record transfer fee for a defender. Klopp's side finished fourth in the 2017–18 Premier League, securing qualification for the Champions League for a second consecutive season. Along with the emergence of Andy Robertson and Trent Alexander-Arnold as regular starters at fullback, Van Dijk and Dejan Lovren built a strong partnership at the heart of Liverpool's defence, with the Dutchman being credited for improving Liverpool's previous defensive issues. In the summer transfer window, Klopp made a number of high profile signings including midfielders Naby Keïta and Fabinho, forward Xherdan Shaqiri and goalkeeper Alisson Becker. Liverpool started the 2018–19 season with their best league start in the club's 126 year history, winning all of their first six matches. On 2 December 2018, Klopp was charged with misconduct after running onto the pitch during the Merseyside Derby to celebrate Divock Origi's 96th minute winning goal with goalkeeper Alisson Becker. Following a 2–0 win against Wolverhampton Wanderers, Liverpool ended Christmas Day four points clear at the top of the Premier League. A 4–0 win against Newcastle United on Boxing Day saw Klopp's side extend their lead in the league to six points at the half-way point of the season, as well as becoming only the fourth Premier League team to be unbeaten at this stage. It was Klopp's 100th win as Liverpool manager in 181 matches. Klopp's defensive additions proved to be effective as his side equalled the all-time record for the fewest goals conceded at this stage of a top-flight season, conceding just 7 goals and keeping 12 clean sheets in 19 matches. On 29 December 2018, Klopp's side thrashed Arsenal 5–1 at Anfield, extending their unbeaten home run in the league to 31 matches, their joint-longest ever unbeaten home run in the competition. The result also saw them move nine points clear at the top of the league, and meant Liverpool won all 8 out of their 8 matches played in December. Klopp subsequently received the Premier League Manager of the Month award for December 2018. In the 2018–19 UEFA Champions League, Klopp's side finished second in their group to qualify for the knockout phase after winning 1–0 against Napoli. On 26 September 2018, Klopp's side were knocked out in the third round of the League Cup after losing 2–1 to Chelsea, their first defeat of the season in all competitions. Liverpool were knocked out of the FA Cup after losing 2–1 to Wolves in the third round as Klopp fielded a weak side, making nine changes to his starting eleven including two teenage debutants. Klopp is a notable proponent of Gegenpressing, a tactic in which the team, after losing possession of the ball, immediately attempts to win back possession, rather than falling back to regroup. Klopp has stated that a well-executed counter-pressing system can be more effective than any playmaker when it comes to creating chances. Commenting on his pressing tactics, Klopp said that "The best moment to win the ball is immediately after your team just lost it. The opponent is still looking for orientation where to pass the ball. He will have taken his eyes off the game to make his tackle or interception and he will have expended energy. Both make him vulnerable". The tactic requires great amounts of speed, organisation and stamina, with the idea of regaining possession of the ball as far up the pitch as possible in order to counter possible counter-attacks. It also requires high levels of discipline: The team must be compact to close down spaces for the opponent to thread passes through, and must learn when to stop pressing to avoid exhaustion and protect from long balls passed into the space behind the pressing defence. Despite Klopp's pressing tactics resulting in a high attacking output, his Liverpool side were criticised at times for their inability to control games and keep clean sheets. However, Klopp developed his tactics to incorporate more possession based football and more midfield organisation, as well as overseeing the transfers of Alisson, Van Dijk, Keïta and Fabinho ahead of the 2018–19 season which saw Liverpool achieve their best league start in the club's history, and equal the all-time record for the fewest goals conceded at the mid-point of a top-flight season, conceding just 7 goals and keeping 12 clean sheets. "If you win the ball back high up the pitch and you are close to the goal, it is only one pass away a really good opportunity most of the time. No playmaker in the world can be as good as a good counter-pressing situation." —Klopp explaining his belief in the effectiveness of Gegenpressing in creating chances. One of Klopp's main influences is Italian coach Arrigo Sacchi, whose ideas about the closing down of space in defence and the use of zones and reference points inspired the basis of Klopp's counter-pressing tactics, as well Wolfgang Frank, his former coach during his time as a player for Mainz from 1995–97 and then 1998–2000. Klopp himself said "I’ve never met Sacchi, but I learned everything I am as a coach from him and my former coach [Frank], who took it from Sacchi". The importance of emotion is something Klopp has underlined throughout his managerial career, saying "Tactical things are so important, you cannot win without tactical things, but the emotion makes the difference". He believes that the players should embrace their emotions, describing how "[football is] the only sport where emotion has this big of an influence". Ahead of the Merseyside Derby in 2016, Klopp said "The best football is always about expression of emotion". In his first two full seasons at Liverpool, Klopp almost exclusively employed a 4–3–3 formation, utilising a front three of wingers Mohamed Salah and Sadio Mané surrounding false-9 Roberto Firmino, supported by Philippe Coutinho in midfield. The foursome earned the moniker of the 'Fab Four' as they supplied the majority of the team's goals over this period of time. Firmino's exceptionally high number of tackles for a striker under Klopp's management encapsulates his style of play, demanding a high-press from all his players and having his striker defend from the front. Following Coutinho's departure in January 2018, the remaining front three increased their attacking output and continued to create chances as Salah won the Premier League Golden Boot in 2018. 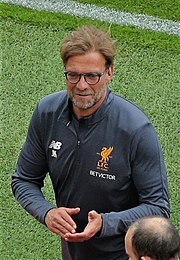 In the 2018–19 season Klopp utilised the 4–2–3–1 formation, which he had previously used at Dortmund, as well as the 4–3–3 formation. While this was partially to account for a number of injuries to key players, it also allowed Klopp to accommodate new signing Xherdan Shaqiri, playing Firmino in a more creative role and allowing Salah to play in a more central offensive position. "Maybe Klopp is the best manager in the world at creating teams who attack [...] I don’t think there is another team in the world attacking in this way with so many players capable of launching moves in an instant. [...] When Klopp speaks about his football being heavy metal, I understand completely. It is so aggressive. For the fans it is really good." —Pep Guardiola speaking about Klopp, who remains the only manager with a positive head-to-head record against the Spaniard, in 2016. Klopp is often credited with pioneering the resurgence of Gegenpressing in modern football, and is regarded by fellow professional managers and players as one of the best managers in the world. In 2016, Guardiola suggested that Klopp could be "the best manager in the world at creating teams who attack". As well receiving plaudits for his tactics, Klopp is also highly regarded as a motivator, with striker Roberto Firmino saying "He motivates us in a different way every day", and being praised by Guardiola as a "huge motivator". Klopp has also received praise for building competitive teams without spending as much as many direct rivals, placing emphasis on sustainability. Klopp has gained notoriety for his enthusiastic touchline celebrations, although received criticism in 2018 for taking things 'too far' when running to on to the pitch to embrace Alisson Becker in celebrating an added time winner in the Merseyside Derby. Pep Guardiola spoke in defence of Klopp, saying "I did it against Southampton. There are a lot of emotions there in those moments". Klopp has been married twice. He was previously wedded to Sabine and they have a son, Marc (born 1988), who has played for a number of German clubs including FSV Frankfurt under-19s, KSV Klein-Karben, SV Darmstadt 98, Borussia Dortmund II and the Kreisliga side VfL Kemminghausen 1925. On 5 December 2005, Klopp married social worker and children's writer Ulla Sandrock. They met at a pub during an Oktoberfest celebration that same year. She has a son, Dennis, from a previous marriage. Klopp is a Protestant Christian who has referred to his faith in public, citing the importance of Jesus in his life in a media interview. In an interview for The Guardian in April 2018, Klopp expressed his opposition to Brexit. Politically, Klopp considers himself left-wing, stating: "I'm on the left, of course. More left than middle. I believe in the welfare state. I'm not privately insured. I would never vote for a party because they promised to lower the top tax rate. My political understanding is this: if I am doing well, I want others to do well, too. If there's something I will never do in my life it is vote for the right". In 2005, Klopp was a regular expert commentator on the German television network ZDF, analysing the Germany national team. He worked as a match analyst during the 2006 World Cup, for which he received the Deutscher Fernsehpreis for "Best Sports Show" in October 2006, as well as Euro 2008. Klopp's term came to an end after the latter competition and he was succeeded by Oliver Kahn. During the 2010 World Cup, Klopp worked with RTL alongside Günther Jauch, for which Klopp again won the award for the same category. Klopp has also appeared in the documentary films Trainer! (2013) and Und vorne hilft der liebe Gott (2016). Klopp's popularity is used in advertisements by, among others, Puma, Opel and the German cooperative banking group Volksbanken-Raiffeisenbanken. According to Horizont, trade magazine for the German advertising industry, and the business weekly Wirtschaftswoche, Klopp's role as "brand ambassador" for Opel successfully helped the struggling carmaker to increase sales. He is also an ambassador for the German anti-racism campaign "Respekt! Kein Platz für Rassismus" ("Respect! No room for racism"). ^ All appearances in DFB-Pokal. ^ Appearances in Aufstiegsrunde 2. Bundesliga (Promotion play-offs). ^ Appearances in the 2. Bundesliga Süd as the league was split into a 'North' and 'South' due to the merging of clubs from former East Germany. Klopp (second from left), Hans-Joachim Watzke, Michael Zorc and Gerd Pieper celebrate winning the Bundesliga in 2011. Olley, Declan (25 November 2017). "Chelsea's Antonio Conte praises Jurgen Klopp as 'one of the world's best coaches'". news.sky.com. Sky News. Retrieved 28 December 2018. Bascombe, Chris (15 October 2016). "Sadio Mane reveals why he was right to choose Liverpool over Man Utd". telegraph.co.uk. The Telegraph. Retrieved 28 December 2018. Russell, Jordan (23 April 2018). "Roma, Totti: 'Klopp is one of the best coaches in the world'". calciomercato.com. Calcio Mercato. Retrieved 28 December 2018. "Jürgen Klopp: A world-class coach, made in the Bundesliga". bundesliga.com. Bundesliga. Retrieved 28 December 2018. ^ Dortmund's record number of points (81) in the 2011–12 season was broken by Bayern Munich (91) in the 2012–13 season. ^ The record number of points, for the whole season and the second half of the season, and the record number of league wins set or equalled by Dortmund in the 2011–12 season were broken by Bayern Munich in the 2012–13 season. ^ Malam, Charlie (24 December 2015). "From Mainz to Merseyside: What does the next chapter hold in the Jürgen Klopp story?". Vavel. Retrieved 12 August 2018. ^ "Jürgen Klopp League Managers Association profile". League Managers Association. Retrieved 12 August 2018. ^ a b "Glatten feiert Jürgen Klopp". Stuttgarter Zeitung (in German). Deutsche Presse-Agentur. 26 May 2011. Retrieved 10 August 2018. ^ Liew, Jonathan (10 October 2015). "The making of Jürgen Klopp". The Daily Telegraph. Retrieved 10 August 2018. ^ Kramer, Jörg (11 April 2011). "Das System Klopp". Der Spiegel (in German). Retrieved 12 August 2018. ^ Gerber, Steffen (7 May 2012). "Private Einblicke von Klopp – Vater wäre stolz auf BVB-Trainer gewesen". Westdeutsche Allgemeine Zeitung (in German). Retrieved 10 August 2018. ^ Rackles, Domenic (25 January 2014). "Was Klopp mit Sindlingen verbindet" [What connects Klopp to Sindlingen]. Höchster Kreisblatt (in German). Archived from the original on 16 August 2016. Retrieved 16 October 2015. ^ a b c d e f g h Malam, Charlie (24 December 2015). "From Mainz to Merseyside: What does the next chapter hold in the Jürgen Klopp story?". vavel.com. Vavel. Retrieved 28 December 2018. ^ Hunter, Andy (25 November 2015). "Jürgen Klopp: I wanted to be a doctor. I think I've still got 'helper syndrome'". theguardian.com. The Guardian. Retrieved 29 December 2018. ^ Jürgen Klopp über sein Studium an der Goethe-Uni (in German). Germany. 6 December 2013. Retrieved 10 August 2018. ^ "Jürgen Klopp Bundesliga profile". Bundesliga.de (in German). Archived from the original on 20 April 2001. Retrieved 12 August 2018. ^ a b "Jürgen Klopp German Football Association profile". German Football Association (in German). Retrieved 12 August 2018. ^ a b Hesse, Uli. "How Klopp's playing career shaped his coaching style". FourFourTwo. Retrieved 12 August 2018. ^ Hartmann, Ulrich (11 July 2012). "Kabarettist im Kapuzenpulli". Süddeutsche Zeitung (in German). Retrieved 17 July 2013. ^ a b Nalton, James. "Jurgen Klopp's football philosophy explained in 10 key quotes". thisisanfield.com. This is Anflied. Retrieved 28 December 2018. ^ Honigstein, Raphael. "The Passion of Klopp". goal.com. GOAL. Retrieved 29 December 2018. ^ "Trainer Krautzun bei Mainz 05 entlassen" [Manager Krautzun released by Mainz 05]. Rheinische Post (in German). Deutsche Presse-Agentur. 27 February 2001. Retrieved 18 May 2016. ^ "Mainz 05 entlässt trainer Krautzun" [Mainz 05 sack manager Krautzun]. Junge Freiheit (in German). Deutsche Presse-Agentur, Sport-Informations-Dienst. 28 February 2001. Retrieved 18 May 2016. ^ Ron (28 February 2001). "FSV Mainz 05 – MSV Duisburg 1:0 (1:0)". Bundesliga (in German). Archived from the original on 19 April 2001. Retrieved 18 May 2016. ^ "Foto-show: Die besten bilder aus Jürgen Klopps karriere" [Image slideshow: The best images of Jürgen Klopp's career]. T-Online (in German). Retrieved 18 May 2016. ^ a b Malam, Charlie (24 December 2015). "From player to manager - Klopp's sudden step-up". vavel.com. Vavel. Retrieved 28 December 2018. ^ Alf, Andreas (14 July 2005). "Mainz take step into unknown". UEFA. Retrieved 18 May 2016. ^ Rehberg, Reinhard; Schneider, Jörg (23 May 2007). "Jürgen Klopp im interview: Abstieg ist verarbeitet" [Jürgen Klopp in an interview: Relegation is processed]. Rhein-Zeitung (in German). Retrieved 19 May 2016. ^ "Klopp nimmt tränenreichen Abschied von Mainz" [Klopp takes tearful farewell to Mainz]. Handelsblatt (in German). 19 May 2008. Retrieved 19 May 2016. ^ a b "1. FSV Mainz 05 – Trainerhistorie" (in German). kicker. Retrieved 25 January 2016. ^ "Klopp entfacht beim BVB aufbruchstimmung" [Klopp kindles departure tendency with BVB]. Der Tagesspiegel (in German). 23 May 2008. Retrieved 20 May 2016. ^ "Absturz des BVB: Doll tritt in Dortmund züruck" [Crash of BVB: Doll withdraws in Dortmund]. Der Spiegel (in German). 19 May 2008. Retrieved 20 May 2016. ^ Fiore, Raphael (19 May 2008). "Doll verlässt Borussia Dortmund" [Doll leaves Borussia Dortmund]. Blick (in German). Retrieved 20 May 2016. ^ "Valdez vollendet Arbeitssieg". kicker.de (in German). 9 August 2008. Retrieved 10 August 2018. ^ "Dortmund beat Bayern to retain Super Cup". ESPN Soccernet. 23 July 2008. Retrieved 19 May 2012. ^ "1. Bundesliga – Spieltag / Tabelle". kicker.de (in German). kicker. Retrieved 25 July 2016. ^ "Borussia Dortmund wrap up Bundesliga title". www.guardian.co.uk. Guardian Online. 30 April 2011. Retrieved 1 May 2011. ^ "Borussia Dortmund win title". Eurosport. 1 May 2011. Retrieved 16 May 2011. ^ a b "Dortmund crowned Bundesliga champions". Independent Online (South Africa). South African Press Association, Agence France-Presse. 30 April 2011. Retrieved 12 August 2018. ^ "Borussia Dortmund feiert Deutsche Meisterschaft". Augsburger Allgemeine (in German). 30 April 2011. Retrieved 12 August 2018. ^ a b "Ronaldo's hat-trick Restores Real's Lead; Dortmund Beats Bayern". Bloomberg BusinessWeek. 11 April 2012. Retrieved 16 May 2012. ^ Penders, Peter (5 May 2012). "Dortmunder Rekord-Meister" [4–0 against Freiburg: Dortmunder record champions]. Frankfurter Allgemeine (in German). Retrieved 20 May 2016. ^ "Season review: Germany". UEFA. 23 May 2012. Retrieved 23 May 2012. ^ Rößner, Jörg (19 May 2013). "Super Saison! Meister Bayern stellt 30 Rekorde auf" [Super season! Champions Bayern is on 30 records]. Die Welt (in German). Retrieved 20 May 2016. ^ "Fährmann bringt BVB zur Verzweiflung" (in German). kicker. 23 July 2011. Retrieved 25 July 2016. ^ a b c "Borussia Dortmund win domestic double beating Bayern Munich". zeenews.com. 13 May 2012. Retrieved 19 May 2012. ^ "Dortmund rout Bayern to claim double". ESPN Soccernet. 12 May 2012. Retrieved 12 May 2012. ^ "Bundesliga champ Borussia Dortmund beats Bayern Munich 5–2 to win German Cup final". WP Sports. 12 May 2012. Retrieved 12 May 2012. ^ Püschel, Morten (27 July 2012). "Klopp eyes Dortmund success at home and abroad". UEFA.com. UEFA. Retrieved 28 December 2018. ^ Ahmed, Shahan (6 November 2012). "Real Madrid, Borussia Dortmund meet again in Champions League 'group of death'". Yahoo! Sports. Retrieved 20 May 2016. ^ "Klopp: "Überragend, großartig, überraschend"". Rheinische Post (in German). 5 December 2012. Archived from the original on 23 October 2016. Retrieved 11 September 2016. ^ "Bayern Munich to face Barca in semis, Real vs Dortmund". Reuters. 12 April 2013. Retrieved 20 May 2016. ^ "Jürgen Klopp targets Champions League final glory for Dortmund". The Guardian. London. 30 April 2013. Retrieved 1 May 2013. ^ Röckenhaus, Freddie (23 April 2013). "Von Guardiola ins Paradies gelockt". Süddeutsche Zeitung (in German). Retrieved 30 December 2018. ^ "Götze wechselt für 37 Millionen zum FC Bayern". Die Welt (in German). 23 April 2013. Retrieved 30 December 2018. ^ "Mario Götze to join Bayern Munich from Borussia Dortmund". Guardian. 23 April 2013. Retrieved 30 December 2018. ^ "Jürgen Klopp annoyed at timing of Mario Götze's Bayern Munich deal". Guardian. 23 April 2013. Retrieved 30 December 2018. ^ Uersfeld, Stephan (29 May 2013). "Bayern chose Gotze over Neymar". ESPN FC. Retrieved 30 December 2018. ^ a b "Robben setzt Bayern Europas Krone auf". kicker (in German). 25 May 2013. Retrieved 19 March 2014. ^ Hallam, Mark (12 August 2012). "Supercup: Bayern best Dortmund". Deutsche Welle. Retrieved 25 July 2016. ^ "Bayern entthront Dortmund". n-tv (in German). 27 February 2013. Retrieved 12 August 2018. ^ "Klopp signs Dortmund extension until 2018". Goal.com. 30 October 2013. Retrieved 30 October 2013. ^ "Klopp muss 10.000 Euro Strafe zahlen". Süddeutsche Zeitung (in German). 17 March 2014. Retrieved 19 March 2014. ^ a b c Kops, Calle (17 March 2014). "Dortmund's 'repeat offender' Klopp hit with fine". Deutsche Welle. Retrieved 19 March 2014. ^ "Robert Lewandowski to join Bayern Munich from Borussia Dortmund". bbc.co.uk. BBC Sport. 4 January 2014. Retrieved 30 December 2018. ^ a b Kimball, Spencer (27 July 2013). "Dortmund beat Bayern in German Supercup". Deutsche Welle. Retrieved 25 July 2016. ^ a b "Borussia Dortmund". kicker.de (in German). kicker. Retrieved 25 July 2016. ^ a b Hallam, Mark (13 August 2014). "Dortmund dominate Bayern to claim Supercup". Deutsche Welle. Retrieved 25 July 2016. ^ a b "Jurgen Klopp: Borussia Dortmund coach to leave at end of the season". BBC Sport. 15 April 2015. Retrieved 15 April 2015. ^ "Jürgen Klopp verlässt Borussia Dortmund zum Saisonende". Neue Osnabrücker Zeitung (in German). Deutsche Presse-Agentur. 15 April 2015. Retrieved 12 August 2018. ^ Hummel, Thomas (15 April 2015). "Der große Kopf muss weg". Süddeutsche Zeitung (in German). Retrieved 15 April 2015. ^ Müller, Oliver (10 May 2015). "Der seltsame Effekt von Klopps Rücktrittsplan". Die Welt (in German). Retrieved 3 November 2016. ^ Wallrodt, Lars (30 May 2015). "In 16 Minuten zerstört Wolfsburg Dortmunds Pokaltraum". Die Welt (in German). Retrieved 30 May 2015. ^ a b "Borussia Dortmund – Trainerhistorie" (in German). kicker. Retrieved 25 January 2016. ^ "Liverpool FC confirm Jürgen Klopp appointment". Liverpool F.C. 8 October 2015. Retrieved 8 October 2015. ^ Smith, Ben (8 October 2015). "Liverpool: Jurgen Klopp agrees three-year deal as manager". BBC Sport. Retrieved 8 October 2015. ^ "Jürgen Klopp, the 'Normal One' takes over as Liverpool manager". The Guardian. 9 October 2015. Retrieved 19 April 2016. ^ McNulty, Phil (17 October 2015). "Tottenham 0–0 Liverpool". BBC Sport. Retrieved 17 October 2015. ^ "Liverpool 1–0 Bournemouth". BBC Sport. 28 October 2015. Retrieved 5 November 2015. ^ "Chelsea 1–3 Liverpool". BBC Sport. 31 October 2015. Retrieved 31 October 2015. ^ "FC Rubin Kazan 0–1 Liverpool". Sky Sports. 5 November 2015. Retrieved 5 November 2015. ^ "Jurgen Klopp misses Liverpool v Sunderland to have operation". BBC Sport. 6 February 2016. Retrieved 6 February 2016. ^ "Manchester City win Capital One Cup: Willy Caballero the hero in shootout win over Liverpool". Fox Sports (Australia). Agence France-Presse. 29 February 2016. Retrieved 12 August 2018. ^ McNulty, Phil (18 March 2016). "Manchester United 1–1 Liverpool". BBC Sport. Retrieved 16 April 2016. ^ McNulty, Phil (14 April 2016). "Liverpool 4–3 Borussia Dortmund". BBC Sport. Retrieved 16 April 2016. ^ "Liverpool push past 10-man Villarreal and into Europa League final". The Guardian. 5 May 2016. Retrieved 18 May 2016. ^ Bascombe, Chris (18 May 2016). "Liverpool lose Europa League final: I don't think I'm unlucky, says Jurgen Klopp, after fifth final loss". The Daily Telegraph. Retrieved 19 May 2016. ^ "Premier League Table". premierleague.com. Premier League. Retrieved 29 December 2018. ^ "Jurgen Klopp: Liverpool manager signs six-year contract extension". BBC Sport. ^ "Liverpool seal Champions League place with victory over Middlesbrough". The Guardian. 21 May 2017. Retrieved 25 May 2017. ^ UEFA.com. "UEFA Champions League – Man. City-Liverpool". UEFA.com. Retrieved 28 April 2018. ^ "Liverpool weather Roma storm to squeeze into Champions League final". Guardian. 2 May 2018. Retrieved 3 May 2018. ^ "Real nightmare for Karius as Madrid retain their title". Raidió Teilifís Éireann. 26 May 2018. Retrieved 12 August 2018. ^ McNulty, Phil (26 May 2018). "Real Madrid 3-1 Liverpool". BBC Sport. Retrieved 27 December 2018. ^ "Liverpool agree deal to sign Virgil van Dijk". Liverpool F.C. 27 December 2017. Retrieved 30 December 2018. ^ "Van Dijk deal agreed". Southampton F.C. 27 December 2017. Retrieved 30 December 2018. ^ "Virgil van Dijk: Liverpool to sign Southampton defender for world record £75m". BBC Sport. 27 December 2017. Retrieved 30 December 2018. ^ "Premier League Table". premierleague.com. Premier League. Retrieved 27 December 2018. ^ Robinson, Neil (22 May 2018). "Van Dijk has made me a better player, says Liverpool's Lovren". Reuters. Retrieved 30 December 2018. ^ Hunter, Andy (9 April 2018). "Virgil van Dijk brings calm and collective spirit to Liverpool's defence". The Guardian. Retrieved 30 December 2018. ^ Maddock, David (19 March 2018). "How dominant Virgil van Dijk has redefined Liverpool's defence". Mirror. Retrieved 30 December 2018. ^ "Naby Keita to complete Liverpool transfer on July 1". 27 June 2018. ^ "Reds agree deal to sign Fabinho". Liverpool FC. 28 May 2018. ^ "Liverpool complete Xherdan Shaqiri transfer". Liverpool FC. 13 July 2018. ^ "Liverpool complete Alisson Becker transfer". Liverpool FC. 19 July 2018. ^ "Transfer agreed for Alisson to join Liverpool". www.asroma.com. Retrieved 26 October 2018. ^ "Liverpool make best start to a season in their 126-year history with 3–0 Premier League win over Southampton". TalkSport. 22 September 2018. Retrieved 3 December 2018. ^ "Jurgen Klopp: Liverpool manager charged with misconduct for derby celebration". BBC. 3 December 2018. Retrieved 3 December 2018. ^ "Wolves 0–2 Liverpool: Mohamed Salah helps Reds go four points clear". BBC Sport. 21 December 2018. Retrieved 22 December 2018. ^ Johnston, Neil (26 December 2018). "Liverpool 4–0 Newcastle: Reds six points clear at the top". bbc.co.uk. BBC Sport. The BBC. Retrieved 27 December 2018. ^ a b "Comparing Liverpool's stats to the halfway point last season". planetfootball.com. Planet Football. Retrieved 30 December 2018. ^ McNulty, Phil (29 December 2018). "Liverpool 5–1 Arsenal: Roberto Firmino hits hat-trick as Jurgen Klopp's side thrash Arsenal". bbc.co.uk. BBC Sport. Retrieved 29 December 2018. ^ "Manager profile: Jürgen Klopp". Premier League. Retrieved 19 September 2018. ^ "Liverpool 1–0 Napoli: Salah scores as Reds reach Champions League knockout stage". BBC Sport. 11 December 2018. Retrieved 15 January 2019. ^ "Liverpool 1–2 Chelsea". BBC Sport. 6 September 2018. Retrieved 15 January 2019. ^ "Wolves 2–1 Liverpool: Replacements 'failed' Jurgen Klopp". bbc.co.uk/sport. BBC Sport. BBC. 8 January 2019. Retrieved 15 January 2019. ^ Barry Glendenning (26 October 2015). "Football transfer rumours: Pep Guardiola to manage Chelsea?". The Guardian. Retrieved 27 December 2018. ^ "Jurgen Klopp's tactics: What Dortmund tells us about Liverpool". skysports.com. Sky Sports. Retrieved 27 December 2018. ^ Wright, Nick. "How the pressing game is powering the Premier League's top clubs". skysports.com. Sky Sports. Retrieved 27 December 2018. ^ a b Wilson, Jonathan. "Jürgen Klopp Jürgen Klopp's Liverpool and the importance of 'gegenpressing'". theguardian.com. The Guardian. Retrieved 27 December 2018. ^ a b c Díaz, Rehaan. "What makes Liverpool's gegenpressing so good?". sportskeeda.com. Sportskeeda. Retrieved 28 December 2018. ^ McGuire, Sam. "Analysing Liverpool's approach to controlling games and how it can be improved". thisisanfield.com. This is Anfield. Retrieved 30 December 2018. ^ "Liverpool's 17-game unbeaten run a result of improved control, says Klopp". irishtimes.com. The Irish Times. 9 December 2018. Retrieved 30 December 2018. ^ Carroll, James (16 December 2018). "Jürgen Klopp: How positive emotion can help us today". liverpoolfc.com. Liverpool F.C. Retrieved 28 December 2018. ^ Hamouda, Omar (19 April 2016). "Liverpool players must be prepared to "hurt" themselves in derby clash with Everton – Jurgen Klopp". squawka.com. Squawka. Retrieved 29 December 2018. ^ Walsh, Kristian (9 December 2017). "Why Liverpool's 'Fab Four' will not become Anfield greats until they do it consistently". liverpoolecho.co.uk. Liverpool Echo. Retrieved 28 December 2018. ^ Stephens, Shaun. "Roberto Firmino: The world class false nine who perfectly complements Jurgen Klopp's system". sportsjoe.ie. Sports Joe. Retrieved 28 December 2018. ^ Bevan, Chris. "Liverpool v Roma: How Reds have adapted since selling Philippe Coutinho". bbc.co.uk. BBC Sport. Retrieved 28 December 2018. ^ Matchett, Karl (14 November 2018). "Jurgen Klopp discusses Liverpool tactics and formation changes". thisisanfield.com. This is Anfield. Retrieved 28 December 2018. ^ Squires, Theo (3 November 2018). "The formation conundrum facing Jurgen Klopp and Liverpool". liverpoolecho.co.uk. Liverpool Echo. Retrieved 28 December 2018. ^ a b c Wilson, Paul (30 December 2016). "Pep Guardiola says he learned from Jürgen Klopp and praises attacking style". theguardian.com. The Guardian. Retrieved 28 December 2018. ^ Olley, Declan (25 November 2017). "Chelsea's Antonio Conte praises Jurgen Klopp as 'one of the world's best coaches'". news.sky.com. Sky News. Retrieved 28 December 2018. ^ Bascombe, Chris (15 October 2016). "Sadio Mane reveals why he was right to choose Liverpool over Man Utd". telegraph.co.uk. The Telegraph. Retrieved 28 December 2018. ^ Russell, Jordan (23 April 2018). "Roma, Totti: 'Klopp is one of the best coaches in the world'". calciomercato.com. Calcio Mercato. Retrieved 28 December 2018. ^ "Jürgen Klopp: A world-class coach, made in the Bundesliga". bundesliga.com. Bundesliga. Retrieved 28 December 2018. ^ a b Hess, Alex. "FourFourTwo's 50 Best Football Managers in the World 2017: No.9, Jurgen Klopp". fourfourtwo.com. FourFourTwo. Retrieved 29 December 2018. ^ Lusby, Jack (9 March 2017). "Roberto Firmino: "Jurgen Klopp motivates us in a different way every day"". thisisanfield.com. This is Anfield. Retrieved 29 December 2018. ^ "Jürgen Klopp - Top 10 Celebrations". Bundesliga. Retrieved 28 December 2018. ^ de Roché, Art (3 December 2018). "Jurgen Klopp's Merseyside derby celebrations 'went too far', says Danny Mills" (skysports.com). Sky Sports. Retrieved 28 December 2018. ^ Farrell, Dom (3 December 2018). "Guardiola defends Klopp's pitch invasion as derby emotions run high". goal.com. GOAL. Retrieved 28 December 2018. ^ a b "Marc Klopp". kicker (in German). Retrieved 1 October 2017. ^ "Starporträt – Jürgen Klopp". Gala (in German). Retrieved 12 August 2018. ^ "Jürgen Klopp (10.)". Südwestrundfunk (in German). 7 August 2007. Retrieved 1 October 2017. ^ "Jürgen Klopp". Freundin (in German). 16 April 2015. Retrieved 1 October 2017. ^ Kelly, Guy (4 July 2017). "Eight things that prove Jurgen Klopp is a hero among men". The Daily Telegraph. Retrieved 1 October 2017. ^ McRae, Donald (21 May 2013). "Jürgen Klopp rallies neutrals to support 'special' Borussia Dortmund". The Guardian. London. Retrieved 17 July 2013. ^ Haarmeyer, Jan (9 April 2011). "Der Menschenfänger und Trainer Jürgen Klopp" [The human catcher and manager Jürgen Klopp]. Hamburger Abendblatt (in German). Retrieved 1 October 2017. ^ Paschwitz, Christian (12 October 2015). "Klopps irrer Auftakt in Liverpool" [Klopp's crazy start in Liverpool]. Sport1 (in German). Retrieved 1 October 2017. ^ "Gott, Klopp, bist du ein Penner!". Frankfurter Rundschau (in German). 10 September 2012. Retrieved 17 July 2013. ^ Seeger, Stephan (14 January 2011). "Spitzenreiter mit Gottes Segen" (in German). rp-online.de. Retrieved 17 July 2013. ^ "Jürgen Klopp Ein Vorwort" (in German). Fußball-Gott.com. Archived from the original on 14 August 2013. Retrieved 17 July 2013. ^ McRae, Donald (23 April 2018). "Brexit makes no sense and Britain should vote again, says Jürgen Klopp". The Guardian. ^ Jones, Neil (23 November 2017). "Undercover Liverpool talks, texting De Bruyne and left-wing politics - Jurgen Klopp's secrets revealed". Liverpool Echo. Retrieved 17 December 2018. ^ "Sorge ums Detail: ZDF–Teamchef Gruschwitz will virtuelle Abseitslinie". Schwäbische Zeitung (in German). 19 October 2005. Retrieved 10 August 2018. ^ Martin, Uwe (25 June 2006). "Der Fußball-Pendler" [The football commuter]. Frankfurter Allgemeine (in German). Retrieved 20 May 2016. ^ a b "20.10.2006 „Fußball-WM 2006 im ZDF" gewinnt den Deutschen Fernsehpreis 2006" [20 October 2006 „2006 World Cup on ZDF" wins the German Television Award]. Deutscher Fernsehpreis (in German). 20 October 2006. Retrieved 20 May 2016. ^ Erichsen, Björn (9 June 2008). "Euphorie und leichtes Abseits beim ZDF" [Euphoria and lights off at ZDF]. Stern (in German). Retrieved 20 May 2016. ^ Hübner, Peter (25 April 2008). "Klopp geht, Kahn kommt" [Klopp goes, Kahn comes]. Stern (in German). Deutsche Presse-Agentur. Retrieved 20 May 2016. ^ "Jürgen Klopp analysiert für RTL die Fußball-WM 2010". Hörzu (in German). 27 November 2009. Retrieved 12 August 2018. ^ "2010 Beste Sportsendung: Die Fußball-WM 2010 bei RTL". Deutscher Fernsehpreis (in German). Retrieved 10 August 2018. ^ Moore, Paul. "Jürgen Klopp features in an excellent documentary on Netflix". Joe.co.uk. Retrieved 10 August 2018. ^ Hanfeld, Michael (3 June 2013). "Wir rennen um unser Leben". Frankfurter Allgemeine Zeitung (in German). Retrieved 10 August 2018. ^ "Was Kulttrainer Klopp zum lieben Gott einfällt". Die Welt (in German). 1 July 2016. Retrieved 10 August 2018. ^ Baumgartner, Markus (2 July 2018). "Mit Gott auf dem heiligen Rasen". Catholic Church in Switzerland (in German). Retrieved 10 August 2018. ^ Hein, David (13 July 2013). "Schleichwerbevorwürfe: Wie Jürgen Klopp den Opel Adam in Szene setzt". Horizont (in German). Deutscher Fachverlag. Retrieved 29 September 2013. ^ "New Car Monitor: Kloppo macht sich für Opel bezahlt". Horizont (in German). Deutscher Fachverlag. 28 November 2012. Retrieved 29 September 2013. ^ Geißler, Holger (23 September 2013). "BrandIndex: Jürgen Klopp reißt Opel aus dem Imagetief". Wirtschaftswoche (in German). Verlagsgruppe Handelsblatt. Retrieved 29 September 2013. ^ "Jürgen Klopp – Fußballtrainer und Medienstar". vip.de. Retrieved 30 April 2016. ^ "Botschafter – Sport: Jürgen Klopp". respekt.tv. Respekt! Kein Platz für Rassismus. Archived from the original on 2 June 2016. Retrieved 30 April 2016. ^ ""Respekt – kein Platz für Rassismus" – Nuri Sahin als Toleranzbotschafter aktiv". Borussia Dortmund (bvb.de). Retrieved 30 April 2016. ^ "Jürgen Klopp, 2. Bundesliga". worldfootball.net. Welt Fussball. Retrieved 30 December 2018. ^ "Jürgen Klopp, DFB-Pokal". worldfootball.net. Welt Fussball. Retrieved 30 December 2018. ^ "Jürgen Klopp, Aufstiegsrunde 2. Bundesliga". worldfootball.net. Welt Fussball. Retrieved 30 December 2018. ^ "Managers: Jurgen Klopp". Soccerbase. Centurycomm. Retrieved 11 December 2018. ^ "FSV Mainz 05 » Fixtures & Results 2000/2001". worldfootball.net. Welt Fussball. Retrieved 28 December 2018. ^ "FSV Mainz 05 » Fixtures & Results 2001/2002". worldfootball.net. Welt Fussball. Retrieved 28 December 2018. ^ "FSV Mainz 05 » Fixtures & Results 2002/2003". worldfootball.net. Welt Fussball. Retrieved 28 December 2018. ^ "FSV Mainz 05 » Fixtures & Results 2003/2004". worldfootball.net. Welt Fussball. Retrieved 28 December 2018. ^ "FSV Mainz 05 » Fixtures & Results 2004/2005". worldfootball.net. Welt Fussball. Retrieved 28 December 2018. ^ "FSV Mainz 05 » Fixtures & Results 2005/2006". worldfootball.net. Welt Fussball. Retrieved 28 December 2018. ^ "FSV Mainz 05 » Fixtures & Results 2006/2007". worldfootball.net. Welt Fussball. Retrieved 28 December 2018. ^ "FSV Mainz 05 » Fixtures & Results 2007/2008". worldfootball.net. Welt Fussball. Retrieved 28 December 2018. ^ "Borussia Dortmund". kicker.de (in German). kicker. Retrieved 25 July 2016. ^ "Liverpool FC » Fixtures & Results 2015/2016". World Football. Retrieved 29 November 2017. ^ "Liverpool FC » Fixtures & Results 2016/2017". World Football. Retrieved 29 November 2017. ^ "Liverpool FC » Fixtures & Results 2017/2018". World Football. Retrieved 29 November 2017. ^ "Liverpool FC » Fixtures & Results 2018/2019". World Football. Retrieved 27 December 2018. ^ "Mainz 05 schafft Bundesliga-Aufstieg". welt.de. Retrieved 23 May 2004. ^ McNulty, Phil (28 February 2016). "Liverpool 1–1 Manchester City". BBC Sport. Retrieved 13 January 2019. ^ "Real Madrid 3-1 Liverpool". BBC Sport. 26 May 2018. Retrieved 11 January 2019. ^ McNulty, Phil (18 May 2016). "Liverpool 1–3 Sevilla". BBC Sport. Retrieved 13 January 2019. ^ "DER DEUTSCHE FERNSEHPREIS - Die Preisträger 2010" (PDF). DER DEUTSCHE FERNSEHPREIS. deutscher-fernsehpreis.de. Retrieved 29 December 2018. ^ a b "Marco Reus ist Fußballer des Jahres" [Marco Reus is footballer of the year] (in German). kicker.de. 12 August 2012. Retrieved 18 March 2015. ^ "Manager profile: Jürgen Klopp". Premier League. Retrieved 12 April 2019. "Jürgen Klopp competition coaching record". UEFA.